With our wedding fast approaching, there's something else that we're hurtling closer towards as well - our minimoon to New York! I'm *almost* as excited about a week in the sun in my favourite place as I am about marrying my best pal, but maybe lets not tell him that... Anyway, thinking about our upcoming trip has got me reminiscing on some of our favourite things to do there and I realised that despite having visited New York 3 times in the past 3 years, I've never really written any guide posts about the city. So over the next couple of months I'll be pulling together some mini guides to the Big Apple, and I'm kicking it off today with a list of 8 New York bars that you really need to try! Okay, so this bar is definitely at the top of my list because it's where Sam and I got engaged! (You can read more about that here). The drinks are on the pricey side but it's totally worth it for the most spectacular view of Manhattan across the river. Head here at sunset to catch the golden hour and watch the lights come on in the city. Located just down the road from The Ides but with a totally different vibe is Brooklyn Brewery. On a Friday evening the tasting room is open between 6-11pm and it's the perfect place to get the night started. Change your dollars for beer tokens and enjoy supping the huge variety of beers on offer at the same site that they were brewed. PDT stands for Please Don't Tell which is a fitting name for this secret speakeasy bar. You enter through a phone box in a fast food bar and it feels like you're stepping back a century to the prohibition era. This is voted one of the best bars in the world so the drinks are truly magnificent - this is a great place for a quirky treat. More dive bar than speakeasy, The Commodore is one of my favourite places to hang out in Williamsburg. It's always busy, the music is great and the frozen margaritas are like slushies for grown ups. The food is also pretty great here - I'd recommend the burger or the nachos (although make sure you're hungry as the portions are huge!). There are rooftop bars aplenty in New York, but this one is special for a couple of reasons. Firstly the festoon lights and surrounding skyscrapers make it look like something out of a Pinterest dream and secondly because you can order food from Salvation Taco to enjoy alongside your drinks. A perfect way to spend a sunny afternoon! Another Brooklyn fave, Maison Premiere is the perfect place for a slightlier fancier drink in Williamsburg. The cocktails are simply fantastic and if you're feeling peckish then there is also a huge menu of oysters and small plates to choose from. Sit at the bar to truly admire the craftmanship that goes into their drinks. 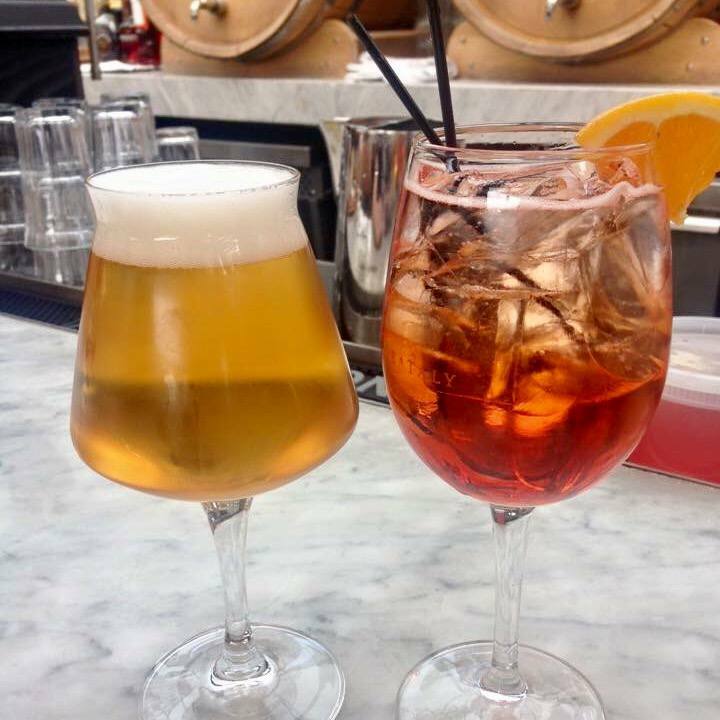 Located on the top floor of the truly epic Eataly is La Birreria, a rooftop restaurant and microbrewery. The retractable roof means that this place is weather proofed and Sam was thoroughly impressed with the huge selection of beer - I obviously opted for an Aperol spritz was very delicious! Voted the world's best bar in both 2015 and 2016, this place is definitely worth putting on your list. The vibe here is very relaxed and informal and the drinks are really great - I can highly recommend ordering a flagon of their famous grog (although prepare to feel very tipsy afterwards!). Have you visited any of these New York bars? Do you have any bars I need to add to the list for our next trip?